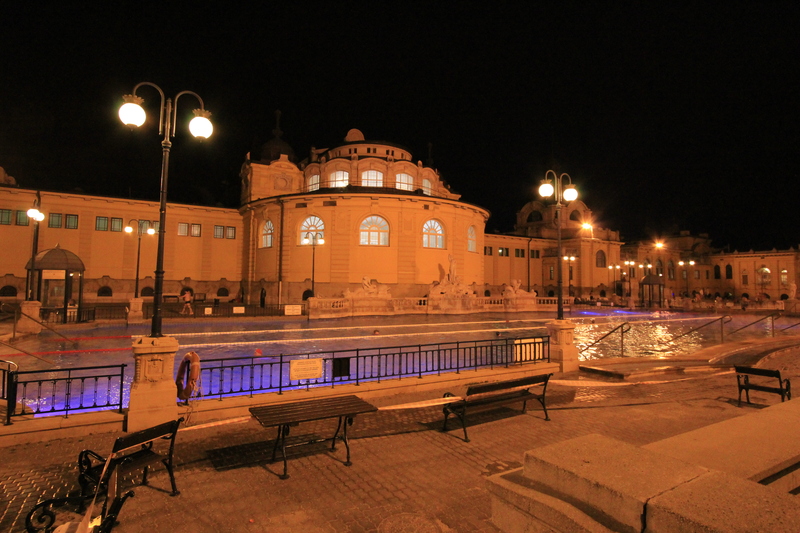 The Szechenyi Baths, Budapest – hot spring on a winter evening. The deep blue sky was slowly turning into blackness. The golden building almost touched the sky, caving into the night, changing colours. There were perfect neo-baroque ornaments on the main entrance façade that finally managed to escape from the prying eyes of the crowd, forcing itself into the humid pools. The aim united the crowd: to absorb some sulphate, calcium, magnesium, bicarbonate, which float lazily in the water. We joined in, driven by the tardiness of the intensive day, hoping to regain our lost strengths. Seeking comfort in the caring hands of the two thermal springs, pulsating under the pavement. 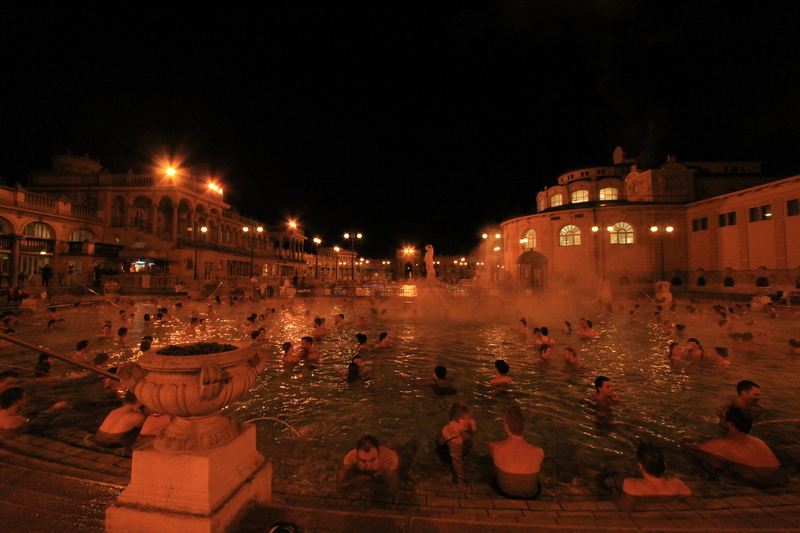 The rush, sensation and chase – all was slowly dissolving into the hot waters of the Szechenyi Baths. The Buda castle, the eagle and the Matthias church, the Fisherman’s Bastion and the Labyrinth I almost lost myself in – left behind, neatly stored on my camera and in my memory. I made space for new sensations, different types of experience; the ones which are shared with others – but still stays your own, indivisible and secret. The one you will feel with your every bone, muscle and move. Enhanced by the ancient foggy steam, that slowly moves around, brightening up the night effortlessly. We explored the indoor pools first. After changing into my swimming suite I dragged my camera around, taking pictures with pleasure and a sense of duty. We sunk willingly into the smaller pools, leaving the king of them all, stretching outside into the cold January night, for later. We have moved from one room to another, comparing the hotness of the water, using our bodies to measure the level of relaxation we could achieve by closing our eyes and letting the water almost surround us completely. The echo of a constant chatter bounced back from one pseudo Greek column to another. The lights reflected their souls in the simple white tiles. A constantly disturbed water was slowly massaging our tired limbs and pumping new life with an unexpected force. The heat easily overpowered the coldness of the winter, trying to make itself at home. We cut the short distance between the building with smaller pools and the gigantic bath in the middle of the complex within 2 minutes. The cold air was trying to sneak under our skin, make us head straight for the safety of the building; as the closed space with hot air pumped through the radiators. I ditched my rented towel on the nearest bench and slipped into the pool. The steps allowed me to lie down comfortably, holding my head above the water. I leaned on my elbows and looked at the sky. Not even a single cloud was breaking the blackness. 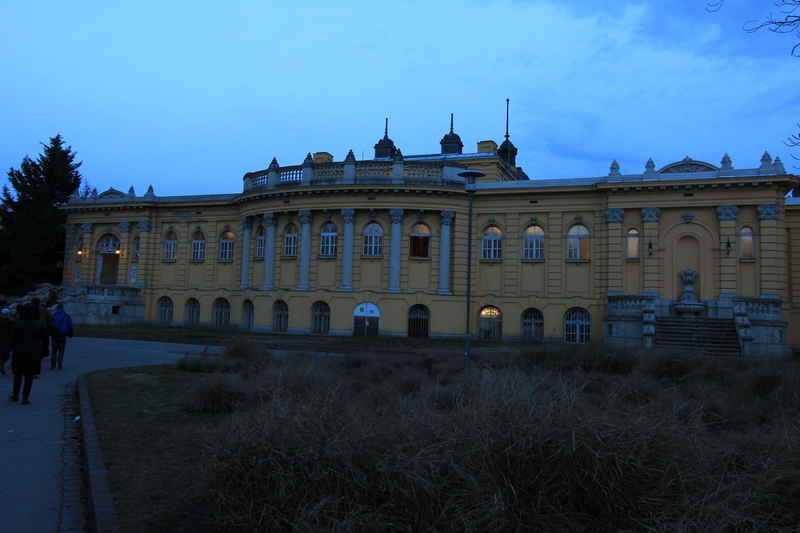 The best way to get here is by underground – M1, stop Széchenyi furdo. You can get the bus number 72 and leave at the same bus stop. Please be aware, that they do not accept credit card payment for the towel and deposit. Prices. Praying inside Gellért Hill – the Cave Church of Budapest. Join our VIP club and be the first to know!